Easy Baked Everything Bagel Salmon Recipe – the best easy baked salmon recipe bursting with everything bagel seasoning flavors! Just season, bake, and flip for fabulous everything salmon flavor in under 15 minutes! This Easy Baked Everything Bagel Salmon is the best of everything bagels thanks to a delicious Everything Bagel Seasoning crust – giving it a ton of flavor without adding in extra work or calories! Salmon is a favorite meal for all sorts of diets and healthy eating plans – and this Everything Bagel Salmon recipe is a perfect low carb salmon recipe, and is also a great keto salmon recipe too! 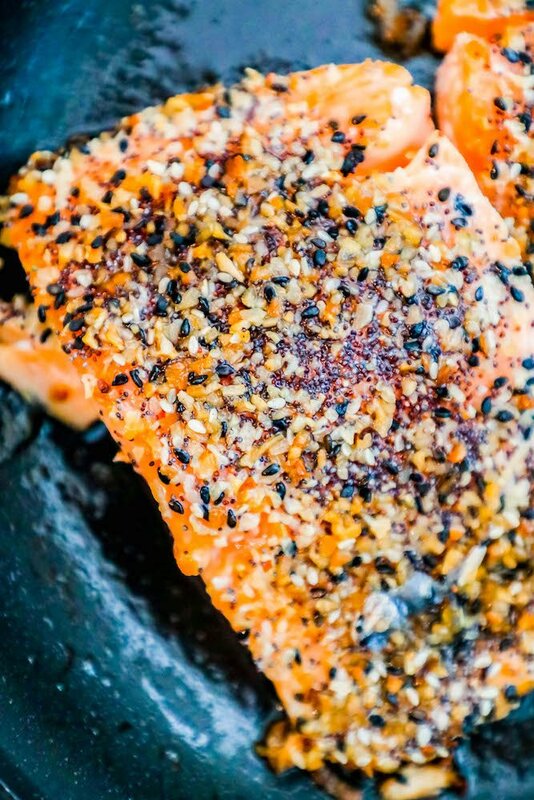 This baked everything bgel salmon is an easy, delicious, and impressive meal to serve anytime you’re looking for a protein packed dinner that looks impressive – but requires very little work. If you can turn on your oven and flip a piece of fish, you’re already on your way to the most delicious baked salmon recipe ever! Just take me to the Easy Baked Everything Bagel Salmon Recipe already! If you’d like to get straight to the recipe and skip my helpful tips and tricks for how to bake salmon, how to get fish to not stick to a pan, how to tell when salmon is cooked, and how to cook salmon without a fishy smell – please scroll to the printable recipe at the bottom of the post (just before comments!). Salmon is one of my favorite fishes to cook because it is so easy and forgiving. Salmon is great fried, sauteed, seared, grilled – and baked! Baking salmon can be as easy as toss it in the oven and open it up to a ton of rich, delicious salmon flavor – but there are a couple tips to make sure you know how to bake salmon that tastes like it’s from your favorite restaurant! I prefer salmon that has been pre-seared in a heavy pan and a little bit of oil before baking for the best results. Pre-searing the top (skinless) side of salmon gives the top a chance to crisp up and caramelize before adding to the oven to cook through. -Add foil for thicker filets. To speed up cooking without drying out your fish, cover with foil when baking. Salmon can be tough and dry when overcooked. Cooking fish can often turn people off because of the smell – but it is pretty easy to cut down on overly fishy smells with some simple tips and tricks. First off, baking salmon, like this Everything Bagel Salmon Recipe calls for, helps to massively cut down on fishy smells in your house when cooking – so take comfort in knowing you’ve already picked a recipe that won’t stink up your house for a dinner party! As salmon loses freshness, the fishy smell is stronger. Use fresh fish for less smell. -Cook in the oven instead of the stovetop. The oven will help absorb some of the fishy smells and fish releases less of them when roasted in the oven. -Add a couple of lemon slices to the pan. Citrus helps diffuse fishy smells, and adds a bit of zip to your salmon’s flavor. One of the biggest complaints to making fish is having it stick to a pan. There are even entire commercial tropes dedicated to stubborn sticky fish! There are a few tried and tested ways how to get fish to not stick to a pan – these will help you feel like a seafood-cooking all star in no time with no stubborn sticky fish to scrub! 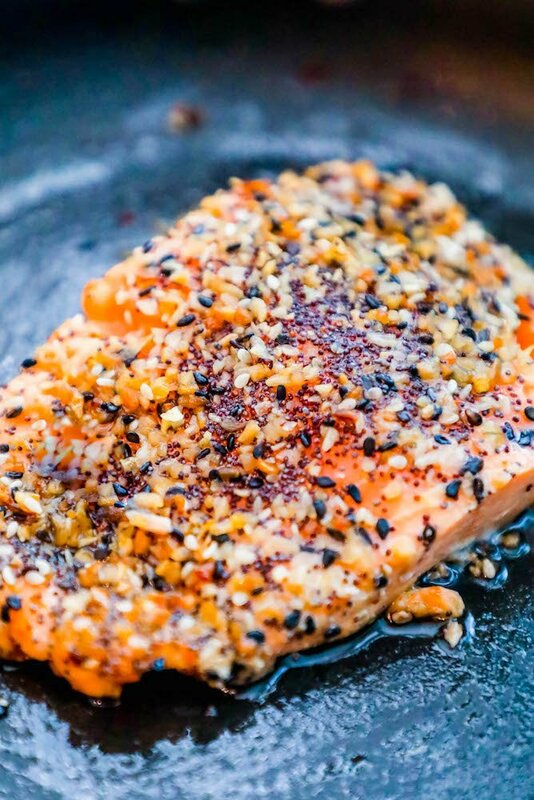 -Heat a heavy pan to a high heat – the hotter the pan when adding the salmon, the less likely it will stick! 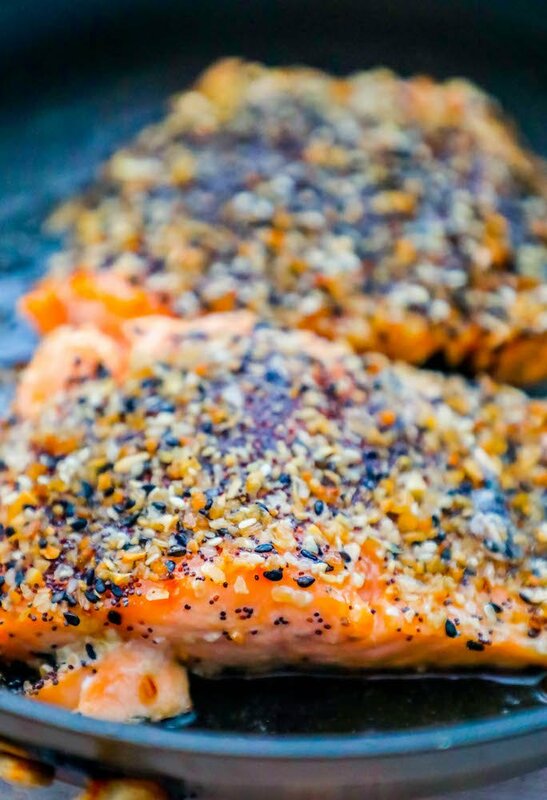 -Coat salmon with seasonings or a crust, like this everything bagel seasoning mix. -Swirl the pan around a lot for the first 10 seconds or so after adding the fish, seasoning side down. -Use a nonstick, oven-safe pan. I prefer mineral pans, ceramic coated pans, or well seasoned cast iron pans. Salmon is a great forgiving fish – the fat in salmon helps to make it still tender and delicious even if slightly overcooked – so it is a fabulous fish for beginner cooks to start with. Even though salmon can take a little extra heat, one of the most frequent questions I get is how you can tell if salmon is done cooking. With these tips and tricks, you’ll know how to tell when salmon is cooked every time – no thermometer required! -Salmon should be opaque outside and slightly translucent inside to be cooked perfectly. -To ensure salmon is cooked through, watch the sides of the fish, especially on the fatter side of your filet, to see when the middle looks white. While this isn’t foolproof (since you’re still looking at the outside of the fish instead of the inside), the sides of salmon can be a great gauge for doneness. 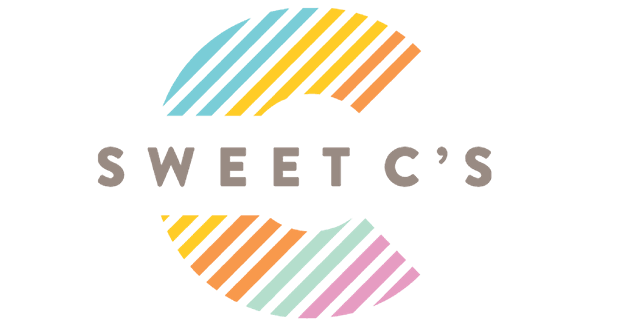 -When salmon is firmed up, but before it releases it’s fat (the white dots that accumulate on salmon when cooked over), salmon is cooked through. 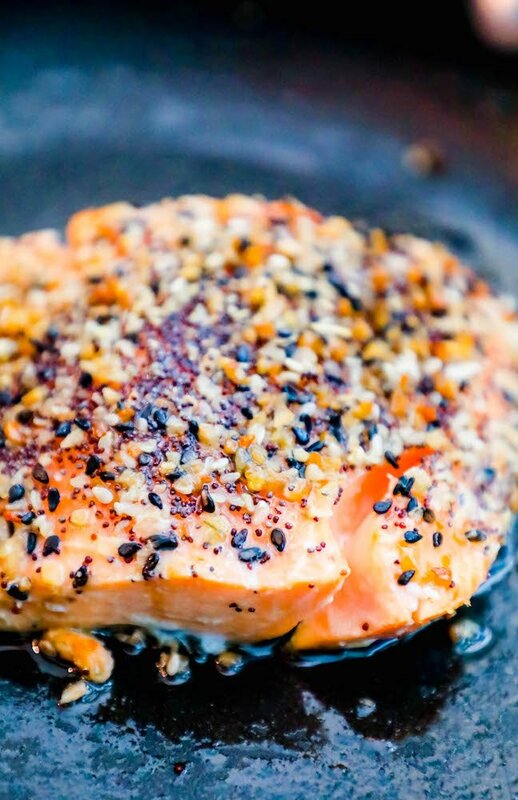 -Searing, then baking, is the best way to cook salmon to done without drying it out since it will help loc in flavors and juices and speed up the cooking of the top of the filet, then the salmon is flipped to the other side which crisps the skin and the oven cooks the salmon the rest of the way. -If salmon is flaky, it’s likely overcooked and dried out. -Instead, salmon should give way and pull apart into pieces when you press the knife into it. This Easy Baked Everything Bagel Salmon recipe relies on a delicious, easy Everything Bagel Seasoning to give it a crunchy, zesty kick. 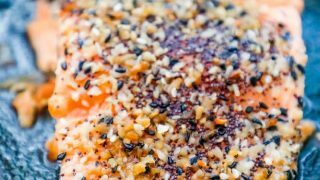 Since Everything Bagel Seasoning is the main flavor for this salmon – as well as the crunchy crust – it is important to use a high quality Everything Bagel Seasoning mix. If you don’t have an Everything Bagel Seasoning Mix you love, no worries, I am providing my favorite below! Mix in a bowl and pour into an airtight jar or container and store in a cool, dry place for up to six months. 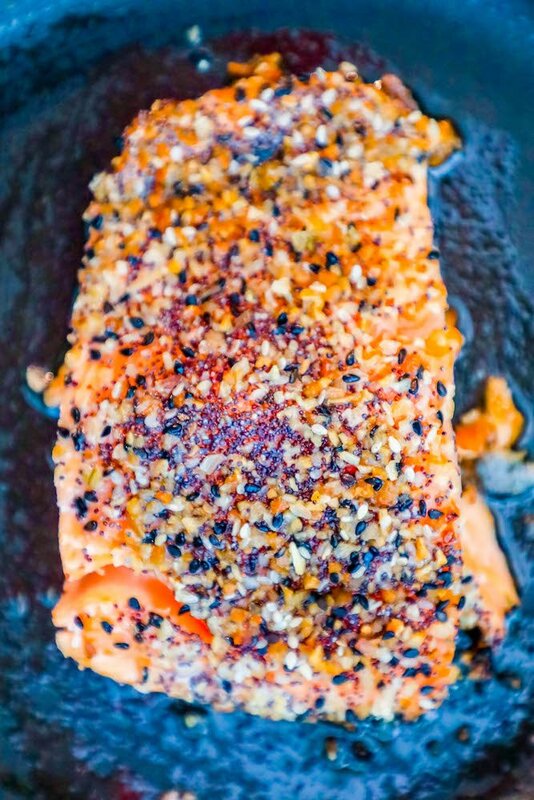 This delicious Everything Salmon Recipe is perfect for a weeknight dinner or even a dinner party – and I’m sharing my favorite dishes to serve alongside Everything Salmon. If you love this easy and delicious Everything Bagel Salmon Recipe as much as I do, please give it five stars below and help me share on pinterest and facebook! Heat oil in a large oven-safe heavy pan (I prefer mineral pans) over medium-high heat. Flip. 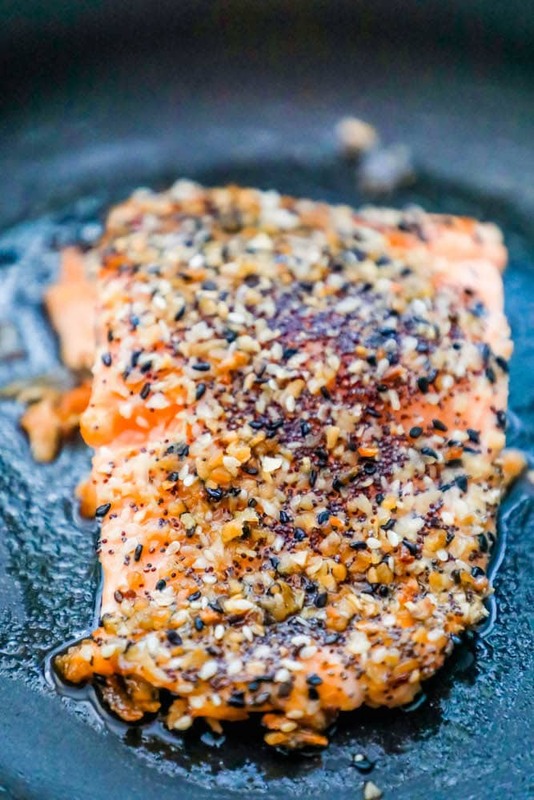 Add salmon seed-side down and sear 3-4 minutes. Flip salmon. Transfer pan with everything salmon into oven and cook 6-8 minutes, until fish is fully cooked. Love how creative this is! Thanks for all the tips to avoid my fish sticking to the pan. OH MY LORDY!!!! You don’t even KNOW how much I LOVE EVERYTHING spice! I seriously want it on EVERYTHING! This salmon is going on my weekly meal plan! Yummy what a fun flavor for salmon! I love this idea! Gives so much flavor to the salmon. Yum!